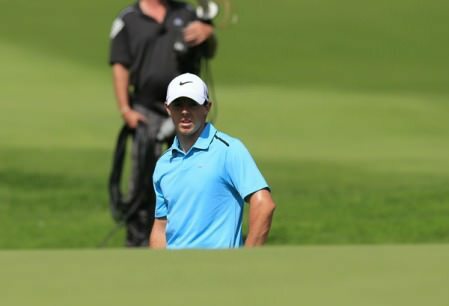 “I want to try and finish as high up in The Race to Dubai,” McIlroy said of his ambitions for the remainder of 2011. “It looks as if Luke Donald has it sealed up. He’s got to going well again today. Donald dropped three shots in his last three holes to post a 68 and finish on one under as 2001 champion David Toms (65), Masters champion Charl Schwartzel (66) and Sweden’s Robert Karlsson (67) set the clubhouse target at two under. Despite playing with heavy strapping on his right arm, McIlroy had high hopes of making a weekend charge but he went the other way instead as he lost all confidence on the greens. After three-putting for a double bogey six at the first, he three-putted again for bogey the third and followed a bogey at the fifth with another three-putt bogey at the eighth to go out in 40. “It’s on the greens where I haven’t been good this week,” he said. “I think I had three three-putts today and three three-putts yesterday and a couple of three-putts on Thursday. He came home in one under par, following birdies at the 13th and 14th with a double bogey after a visit to water at the 15th before hitting a 360 yard drive up the last and a 124 yard wedge to five feet to finish with a birdie. He admitted that his questionable decision to hit from behind a tree root on Thursday was a major mistake and it remains to be seen if he will recover in time to tee it up in Switzerland. “Looking back on it, it probably wasn’t the right thing to do,” he said: “Coming in after a solid week at Akron last week and feeling as if I was hitting it well, I’ll think about that shot on Thursday for a while. McIlroy finished the day 14 shots behind Americans Brendan Steele (66) and Jason Dufner (68) who lead by a stroke from compatriot Keegan Bradley (69) with Scott Verplank (69) three off the pace on four under. No fewer than 16 players are within six shots of the lead with world No 5 Steve Stricker only four behind. 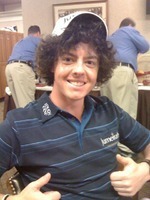 Debut boy Rory McIlroy can’t wait to get back into the limelight and take on Tiger Woods for major glory. The hair apparent - Rory McIlroy as snapped by Paul CaseyThe Ulsterman, 20, has been in a results slump for the past month after his brilliant performances in the Masters and the US Open. But after watching Padraig Harrington square up to Woods in the Bridgestone Invitational last weekend, the Ulster ace is looking forward to the day when he gets his chance to take down the world No 1. McIlroy said: “I think everyone would love to be in the position that Padraig was in on Sunday going head-to-head with Tiger, especially having a three-shot lead and trying to hold him off. 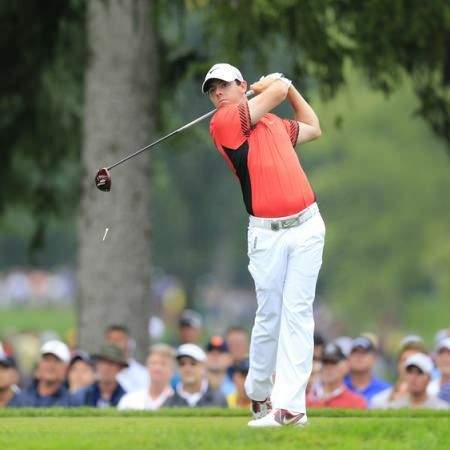 Rory McIlroy came of age in just his fifth major appearance and only his fourth as a professional when he closed with a impressive 70 to finish tied for third with Lee Westwood on three under par at Hazeltine. Rory McIlroy contemplates his position in the water at the fifth. Picture: Eoin Clarke www.golffile.ieRory Mcilroy spoke to TV and radio, headed to change his shoes and then banged them on a locker door in frustration as he headed for the exit and a flight out of Rochester. His discontent was understandable after his potential final round charge was halted almost before it began when he ended up in Allen’s Creek and took a triple bogey seven just five holes into the final round of the US PGA.